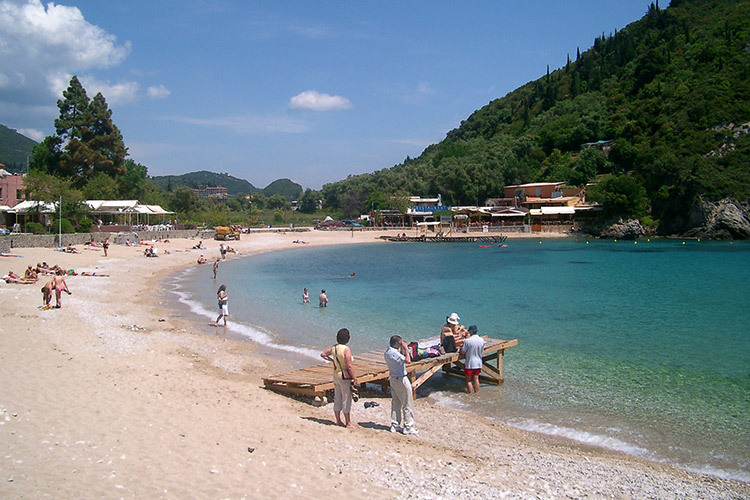 Paleokastritsa is one of the most famous tourist place in Corfu island. This place has in fact very clear sea water and many lonely rocky coves which are fantastic for all those who love snorkeling. You have the opportunity to visit several lovely bays and it is the right place for those who own a boat. Here in Paleokastriza you will not find a real village, however it is plenty of accommodation and tourist services along the coast road. Paleokastritsa is also well described inside our top 10 page. Paleokastritsa includes an area with six small coves and beaches. The principal one is placed just under the monastery and since it’s bigger than the others, it also offers a large choice of tourist structures. A second nice beach is placed next to the small pear where in the summer you can see many boats and yachts. The remaining beaches are reachable only from the sea with a private boat or with a taxi boat service. In this part of Corfu the sea is very deep and the water a little bit cold. Here you can also take for rent beach umbrellas and deck chairs and there are public showers and toilettes. Moreover, in Paleokastriza is possible to take a boat for rent to looking for some sea caves along the coast. For all those who are interested there is a diving centre and many taxi boats. Paleokastritsa is just 20 minutes driving far from Corfu town, you only have to cross the island for its largeness. Here is also possible to rent a motorboat to discover this charming part of the west coast. If you don’t have your own vehicle you can also use the bus service that connects Paleokastritsa with Corfu town every day. Here in Paleokastritsa there are different shops like supermarkets, souvenir shops and everything else you may need. Since 1994 Yannis, a local Corfiot who loves his job, has started his own production of marvellous kitchen tools, toys and different kinds of objects all made by carving local olive wood. Carburi estate in Corfù island is a unique place where to buy handmade craft products. Carburi family here in Corfu has three generations experience in olive oil production. The right place to enjoy yourself during the day with several kinds of activities such as diving, snorkeling, boat trips and many other. Very interesting also will be a visit to the old monastery above the cape. In taverna Delfini you will have the opportunity to enjoy your dinner in a secluded area, surrounded by a picturesque landscape with a fantastic clean sea water under your feet. Taverna Boulis has been selected by Corfu-Kerkyra.eu as one of the best restaurants in Corfu island where to taste traditional Greek food and local specialities. Paleokastritsa is one of the most beautiful and tourist places of Corfu. For this reason you can fin any kind of accommodation you’re looking for, from hotels to cheap studios.